‘top Corp (GME) fell more than 7% in the first hour of Friday’s session after the video game and console chain missed second-quarter revenue goals and lowered comp guidance. Same-store sales plummeted 11%, while global sales fell 7.4%, to $1.63-billion, continuing a contraction intensified by a slow console-upgrade cycle, fewer hit titles and the exodus from physical software into digital-distribution platforms. Even highly profitable used-software sales failed to meet modest expectations, falling more than 3% quarter-over-quarter. The bearish metrics also reflect declining traffic at shopping malls, led by millennial and post-millennial adoption of all-things-digital, with the chain suffering an outsized adverse effect because young males comprise their main demographic. The company has responded with new product lines and its own independent titles, but the effort is unlikely to make up for lost revenues. 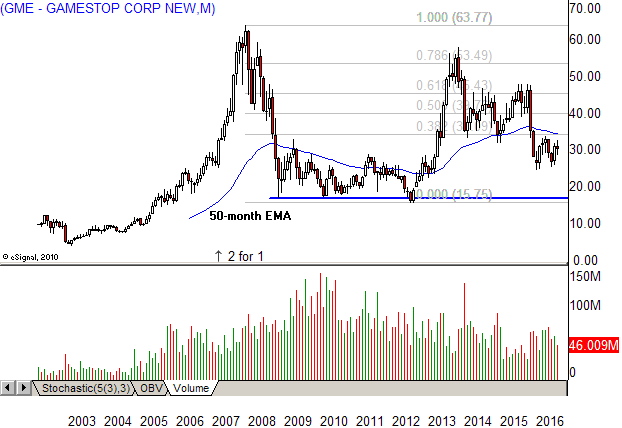 The company came public at $9.63 (post one stock split) in February 2002, right in the middle of the bear market, and carved a sideways pattern into a December breakdown that posted an all-time low at $3.75 in February 2003. It then turned sharply higher, breaking out above 2002 resistance above $12 in 2005 and carving an impressive advance into the December 2007 all-time high print at $63.77. It sold off with world markets during the 2008 economic collapse, with selling pressure continuing into November, when it bottomed out in the low-$20s. A bounce into 2009 got sold aggressively, giving way to a four-year test at support that yielded a breakdown in the third quarter of 2012. The decline settled at a six-year low at $15.32, marking a significant climax, ahead of a new uptrend that stalled in 2013 at the .786 Fibonacci selloff retracement level in the mid-$50s. A vertical decline into 2014 gave way to a 13-point trading range compressed between the .386 and .618 retracement levels, with support at $33 and resistance at $46. 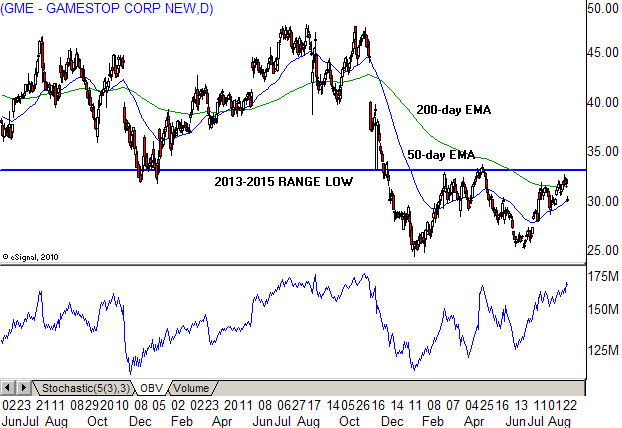 The stock broke range support in December 2015 and then bounced at a two-year low in January 2016. The subsequent recovery stalled at broken range support in March, yielding four months of broad consolidation, ahead of this week’s bearish confessional. The daily view highlights the selling impulse that started above $47 in July 2015, with a breakaway gap into the lower $40s now marking major resistance. The decline cut through the bottom of the 22-month trading range in November (blue line) and continued to lose ground into January. A Fibonacci grid placed over the sell-off aligns the breakdown perfectly at the .386 retracement level. The bounce tested new resistance twice, with aggressive sellers triggering reversals during each breakout attempt. A deep slide into June held above the prior low, signaling the first stage of a possible double bottom that now requires a rally above the blue line to confirm a new uptrend. That’s less likely after this week’s decline, which is now testing 50-day EMA support near $30. On Balance Volume (OBV) offers hope to beaten-down shareholders, rising sharply in three waves after the January low. It’s currently situated close to the 2015 peak, marking a bullish divergence that should limit selling pressure in coming weeks. However, all bets are off until the stock breaks out of the nine-month range with a rally above $34, or breaks down with a decline through $24. Gamestop is getting sold aggressively after second-quarter earnings failed to meet expectations and could test the lower end of a broad trading range into the fourth quarter. Even so, price action reflects a relatively neutral technical outlook due to strong accumulation and broad sideways action so far in 2016. 1 Comment on "Gamestop Price Levels To Watch After Earnings"